Dec 11, 2011 Full Lunar Eclipse at Dawn. This winter's morning dawns as "Sanghamitta Day," the lunar anniversary of one of our ancient great foremothers in Buddhism's welcome arrival to lands abroad to share in the Buddha's Path where she had been asked to come. In our ancient Pali-texts, we find a culture of eclipses marking times and events thought to be particularly special, whether fortuitous or not so. It strikes me that what is fortuitous or not, largely depends upon our mind, upon our perspective, on the foremost folds of the Noble Eightfold Path. The mind that is pure, the mind that is clean, clear, soft, flexible and open receives things differently that the mind that is hard, tight, and contracted. That mind that is unified, whole and with integrity differently then the mind that is fragmented and distracted. Something like the brightness of the reflected moonlight, the mind too may reflect and be imbued and percipient of light fully, partially, or be almost fully obscured --at least in moments-- by obstructions. For some, at some times, this earth, and the things of our world, can seem to be the obstructions. And yet, when the perspective shifts even just a little, the earth becomes our ground, our base, for seeing conditional causality, for seeing the Dhamma, for seeing and knowing and feeling light, in the truth of things as they are--yatha bhutam nyanadassanam. 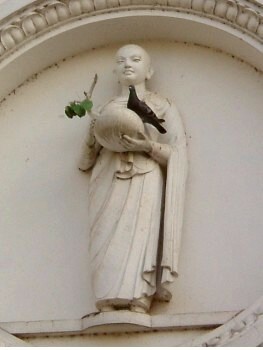 (For those who enjoy Pali chanting, you might know this phrase--seeing and knowing things as they truly are thus. It then continues with--one is freed. So, the very same circumstance, with just a little shift in perspective, can be the fertile ground of suffering, or the fertile ground of the Path, and of liberation. For this reason, our views and our perspective, as well as our intentions and the direction of our motivation -- with regards to everything that happens, everything that we experience -- becomes foundationally important. At the young age of 18, the young woman Sanghamitta was invited by her father to leave her husband and child, and go forth into monastic life, for the sake of her father's desired offering of his own flesh and blood, his own kin, to the Sangha. History does not record her struggle, but rather her ready willingness to do this. And her quick progress on the Path, soon becoming an arahant--a woman fully awake and free. She was then asked again by her father and brother to leave all that she knew of her homeland behind for the sake of women and a people far away whom she had never met, to be an emissary of the Buddha-dhamma and of the Sangha. She undertook a long journey over various lands and ocean, surely not so easy for one who was raised an Indian princess. And the journey was recorded as not an easy one, with storms and various kinds of dangers and obstructions arising, whether mythical, or of the imagination, or very real physical hardship and danger in the material world. History records that she passed through it all, and arrived at her destination with Bo-tree, shining. It is hard to know the mind of an arahant. Even trying, when our grasping mind reaches out to find something to grasp onto, and then utterly fails, is a wonderful exercise. For it is not the object of grasping that is truly sought, but just the opposite. And sensing that, touching into that, and relaxing into that absence of objects of grasping is the most perfect intuition. The space of non-grasping that is clear, and empty, unlimited and free. But still knowing cause and effect. And knowing possibility. So, she came down from her ocean-gone ship, came to shore, and spent the rest of her life in sharing the Dhamma that she had seen and known, and entered into fully embodying, for all the rest of the years of her life. History records that she never returned to India, the crematory remains of her body still lying under recently rediscovered burial mound in Anuraddhapura, Sri Lanka. The remains of her ship too still lie there, as a shrine was built even for it -- earthly elements to our thought made holy by that difficult but successful passage -- its rudder and mast. And her legacy --which is the Buddha's legacy-- still remains. In the bodies of all women and men who see the opportunity in what life presents them, take that opportunity and make the very best of it, and then share those benefits with our world. This is the challenge of the Noble Eightfold Path, the challenge of its leading folds--Right View and Right Intention--the rudder and the mast. The folds out of which the entire Path emerges and and unfolds, flowing forth, centered in Right View and Right Mindfulness, moving on Right Effort -- the place where our ship meets the waters of the Path. I dedicate myself to this Path.